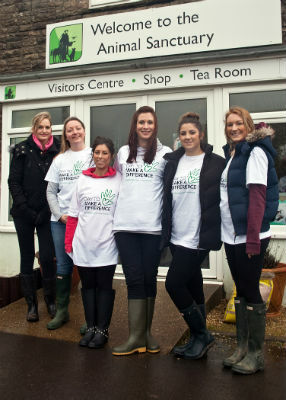 As part of the Lloyds Banking Group ‘Make a Difference’ community scheme, volunteers spent the day at the animal sanctuary and helped with a variety of different tasks which included tidying up the site and getting the paddocks ready for the animals. After a difficult winter, with lots of bad weather, work to tidy up the sanctuary was essential and visitors at our family activity day in April commented on how great the sanctuary looked. 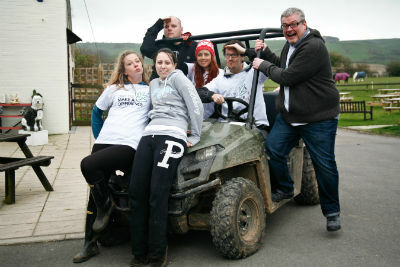 Fundraising Officer Kate Cross said "We’d like to thank Lloyds Bank for all of their support. Everyone has commented how tidy and organised the Sanctuary looks and all the staff really enjoyed having the volunteers here." If your business would be interested in organising a volunteer day at Margaret Green Animal Rescue, please contact Kate by emailing her at . We are currently looking for volunteers to help at our annual dog shows in Devon and Dorset. Our Wingletang Dog Show is on Sunday 8th June and our Dorset Dog Show and Family Fun Day is on Sunday 3rd August. We are looking for volunteers to help with manning stands, collecting donations, directing cars and for lots more! If you are interested in helping, please email Kate at .